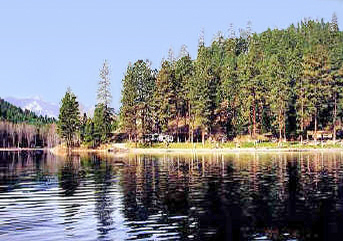 Conconully is 18 miles Northwest of Omak and Okanogan on the Conconully Reservoir in the heart of the sunny Okanogan country. 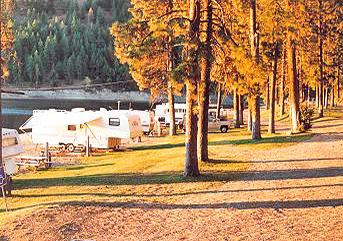 Immaculate and peaceful, Shady Pines Resort is located just 15 miles Northwest of Omak and Okanogan. It is on the 350 acre Conconully Reservoir just 1 1/2 miles from Lake Conconully and many other great fishing lakes are with in just 30 miles. Conconully was once the county seat during the mining era and much history is yours to discover. 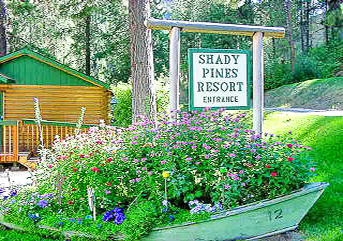 Shady Pines Resort is in the center of some of Washington's best hiking, swimming, water skiing, snowmobiling, fishing, hunting and bicycling. We offer fully equipped cabins, RV parking with full hook ups, tent sites, gift & tackle shop, boat rentals and massage therapy. Nature is your constant companion with wild life and mountains and trees surrounding you. 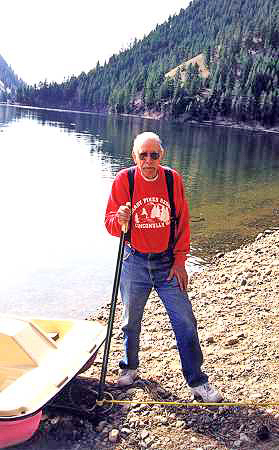 Our low bank beach gives you great lake access for swimming, skiing and fishing. Morning sun and afternoon shade keep you comfortable through out the day. Take advantage of over 350 miles of groomed snowmobile trails and access to many miles of great mountain bike and hiking trails. For information on jet ski and snowmobile rentals visit Franks Rentals. Your hosts Steve and Dena Byl are committed to making your stay with us the best ever! For more information about Conconully click here.